Questions about our homeschool product? Let us know! The Transparent Language Online Homeschool Subscription includes everything you need to support your student and meet the requirements of your district*. 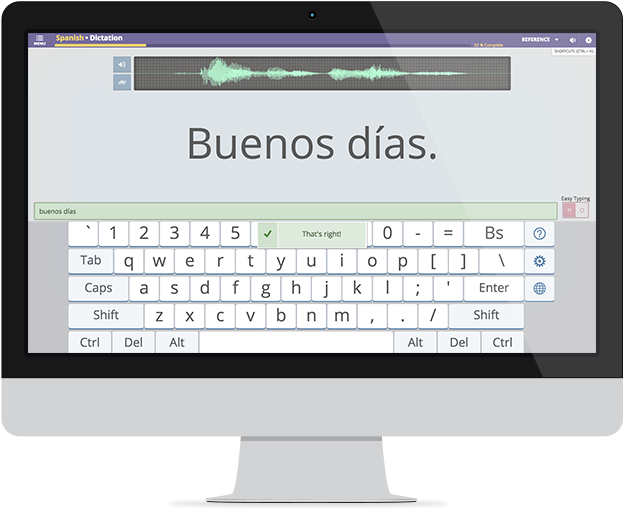 Subscriptions include access to all of the Spanish or French homeschool courses listed below. Separate and secure student accounts allow for each of your children to keep track of their own personal learning. 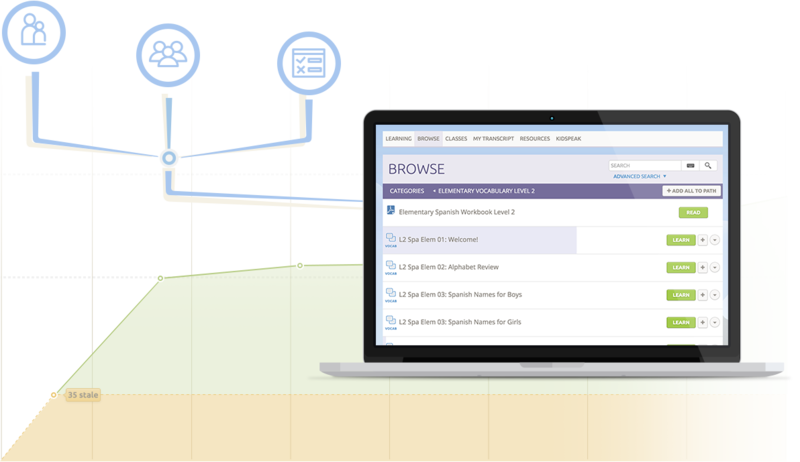 Access the class administration and reporting tools in Transparent Language Online at any time during your subscription to monitor your student’s progress. Instructor guides, workbooks, and other resource material to help you support your students. Activity reports, course completion certificates, and assessment score reports provide detail for submission to district administration*. Having trouble using the program? Subscriptions include access to technical support direct from Transparent Language. These courses deliver 3 years of basic Spanish or French - ideal for students in grades 3, 4, 5, or 6. The program includes 68 complete lessons, divided into 3 levels of increasing depth and duration, all appropriate for young, beginner students. 8 game-like learning activities, complete with native speaker audio, build the four core skills in lessons short enough to keep your student’s attention. A student workbook is also included. Delivering 80+ hours of lessons focused on the everyday lives of typical teens, the “Teen Voices” course is packed with vocabulary your middle and high school students will actually want to use. This beginner-level course includes 3 years of learning material. Also included is a workbook for additional grammatical, cultural, and lexical practice. Parents have access to an answer key for the workbook, as well as an instructor guide that outlines how to conveniently implement the 20-unit course in any schedule. Give your student a robust program that builds all four core skills: listening, speaking, reading, and writing. You can't learn to read or write if you don't know the alphabet. 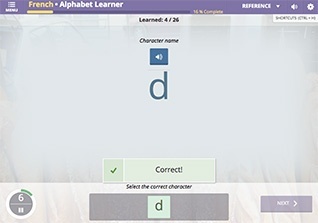 Students also have access to our comprehensive Alphabet courses. 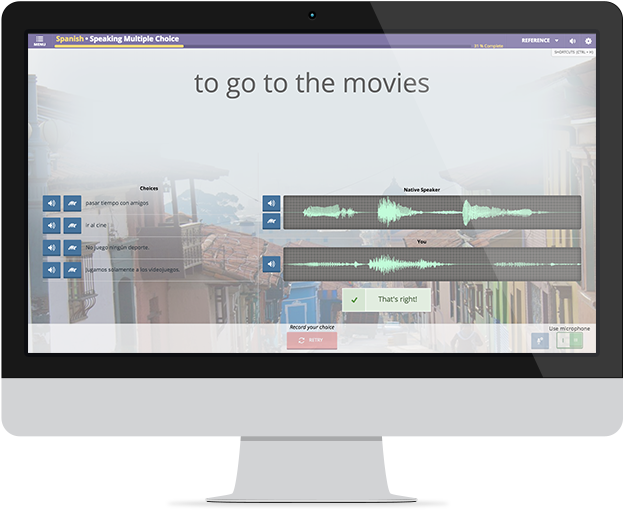 Your student can build proficiency by learning thousands of useful words and phrases categorized by topic and presented in an engaging, memory-building format complete with native speaker pronunciation. 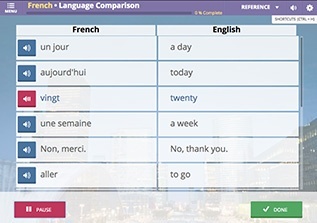 Speech-enable learning activities like Multiple Choice allow your student to answer questions by speaking instead of clicking, encouraging speech in the language. 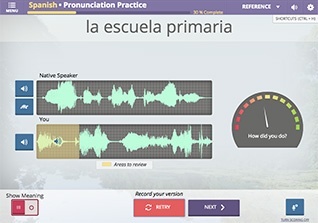 Students can compare their pronunciation to that of a native speaker with our proprietary EveryVoice™ technology in Pronunciation Practice activities. All courses listed above include assessment tests that let you and your student know where they stand. We sure do, and more! 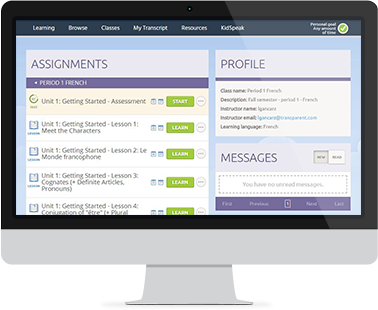 An extensive collection of grammar lessons is appropriately integrated into the courses. These video and written explanations cover hundreds of grammar topics, providing students with a foundation to build upon. Great for exchange students! Students can take their language learning on-the-go with mobile apps that work offline. 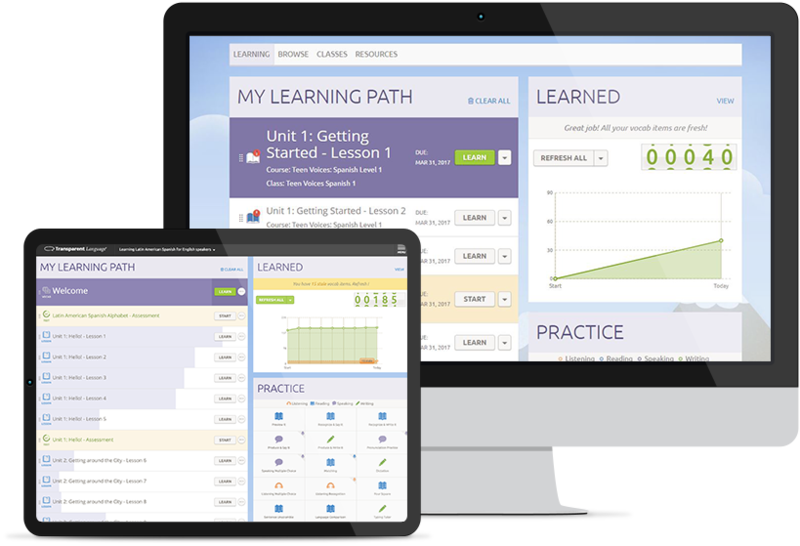 Track and report on your student’s progress and activity. Utilize pre-made courses to save on valuable preparation time. Assign due dates to lessons for your student to complete and monitor their progress through reports. Print workbooks for extra practice and use in the creation of study guides. *It is our intent to develop and maintain these programs of instruction that should meet the requirements of most states and school districts. The courses included in this homeschool program were developed under the supervision of a New York State certified teacher and are intended to meet the requirements of the State of NY, as well as most other states. These materials have been used to support instructional programs delivered by Transparent Language and other schools and have been accepted by various states and school districts for grade appropriate credit. However, such requirements are subject to change and interpretation, so Transparent Language cannot guarantee that all school districts will accept these courses for the intended credits. If your district requires additional support or information about these materials before accepting for credit, please let us know and we will work with you to collect and submit such materials.